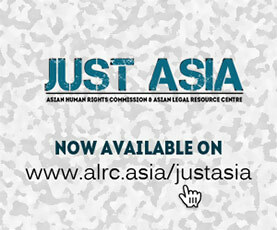 This week Just Asia begins with Nepal, where justice is finally being served to Ganga Maya Adhikari. Ganga Maya had been staging a fast-unto-death at Bir Hospital demanding stringent action against the murderer of her son. The main culprit, Chhabilal Poudel, has surrendered before the Supreme Court, and is now in jail awaiting trial. The government has also given NPR 10 million in cash relief to Ganga Maya. Next, Pakistani peace activist Raza Mahmood Khan has returned home, seven months after he mysteriously went missing. The police are tight lipped however, about where the 40-year-old social activist was found. Pakistan is infamous for the disappearance of those speaking out against the military and extremism. Moving to Indonesia, Jakarta police have shot 52 persons, killing 11, in a recent sweeping operation prior to next month’s Asian Games. Apart from the shootings, the police have arrested some 2000 people, 320 of whom have been named as suspects and criminally charged under the Indonesian Penal Code. Rights groups are protesting the police’s massive extrajudicial killing and deprivation of liberty. In the Philippines, 48 environmental defenders were killed last year, the highest recorded number in the Asian region, says international NGO The Global Witness. The killings are linked to land and agriculture, as well as mining, poaching and logging. Local groups are asking the Philippines’ government to investigate the increasing violence and human rights abuse of affected communities. Next, in India’s state of Madhya Pradesh, the government recently admitted to the death of 72,000 children in the Special Newborn Care Units of government hospitals. Furthermore, as of March 2017, 47% of the posts of government doctors in the state were vacant. This number increases to 66% when examining the level of specialists available, like surgeons, paediatricians, obstetricians and so on. Finally, the Urgent Appeals Weekly features two cases from Indonesia.